Ever had a masala dosa with sweet potato filling? If not then try this wonderful recipe. The sweet potatoes make a great alternative to regular potatoes, giving the masala dosa a new flavor. I am yet to come across an Indian who dislikes dosa! Dosa is an Indian pancake and is an extremely popular South Indian delicacy served mostly for breakfast. There are many varieties of dosa batter that one can make. The traditional one is made using rice and lentils which needs to be soaked, ground and then fermented. Masala Dosa is one of the most favored stuffed pancake variety. Potatoes and green peas are cooked together with spices and this compliments well with the dosa. I have enjoyed the regular masala dosa all my life and it is my favorite South Indian dish. Sweet Potato is very nutritious, it contains antioxidants, anti-inflammatory nutrients, and blood sugar-regulating nutrients. It was just last week that I used this vegetable in my cooking. Until then I was not a great fan of it. But after having made Sweet Potato Masala Puri, I can no longer say that. It does take you some time to get accustomed to its taste, but then you are hooked onto it for life. It is such an easy, hassle free vegetable to cook with. Plus it cooks easily and blends in with any other ingredient smoothly. Now that I have cooked with it, I can think of so many ways to use it in other recipes and just cannot wait to try them out. I had got just 2 sweet potatoes from the grocery store. One I used to make the Masala Puri and was thinking of how else to use the other one. I wanted to make a quick-lunch so that I could focus on my new painting project. Yes, I am super excited. We are doing up the study room and I have taken it upon myself to paint the room. Hence I wanted to wrap up my work in the kitchen to begin my painting work. Since I had already made the dosa batter the day before, I was planning to just have dosa with Green Chutney using Scallions. But you know, I have this strange thing in me, I just cannot cook anything mundane, I have to give it a twist these days. That is why I thought of making a masala dosa filling with the remaining sweet potato. Now this was a first, I had no idea how it was going to turn out. This was something unheard of. I was venturing into a new territory. But I think I needed that adrenaline rush to help me with my new home project and this just did that. I was all excited to try this new recipe. till it turns golden brown. Mash and add ginger and garlic to it along with minced green chillies.
. Saute till the tomatoes are cooked. Next add the bell peppers and green peas. Saute till the veggies are cooked. Add the mashed sweet potato and give it a good mix. , Pour a dollop of dosa batter and spread it like a pancake. You may add oil around the edges if needed. Add a spoonful of the sweet potato mixture in the center and let it cook for a minute. Fold both ends and close the dosa. Take it off the skillet. Serve with any chutney/sambhar. Ever had a masala dosa with sweet potato filling? If not then try this wonderful recipe. The sweet potatoes make a great alternative to regular potatoes. First, boil the sweet potato with some salt and turmeric powder. Mash it lightly. Heat oil in a pan. Temper mustard seeds and cumin seeds. 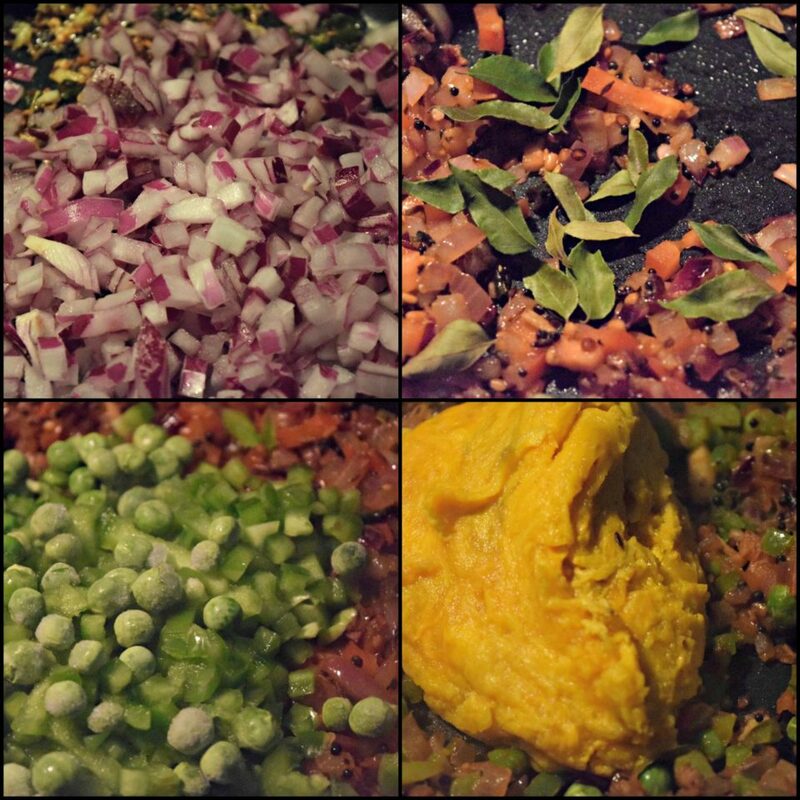 Then add and fry urad dal till it turns golden brown. Mash and add ginger and garlic to it along with minced green chillies. Next add the onions and saute till they turn translucent. Now add the tomatoes, curry leaves, salt and asafoetida. Saute till the tomatoes are cooked. Next add the bell peppers and green peas. Saute till the veggies are cooked. Add the mashed sweet potato and give it a good mix. It's time to add the seasonings like turmeric powder and coriander cumin powder. Lastly garnish it with cilantro. Mix it all together and take this mixture off the flame. Heat a skillet/tava, Pour a dollop of dosa batter and spread it like a pancake. You may add oil around the edges if needed. Add a spoonful of the sweet potato mixture in the center and let it cook for a minute. Refer my dosa batter recipe to get it right. This sweet potato filling is truly a welcome change. A great option for you to try, and is also a great way to make fussy eaters like me enjoy their meal. These stuffed pancakes make for a hearty breakfast or can be served as main course. You can serve any side dish with it. 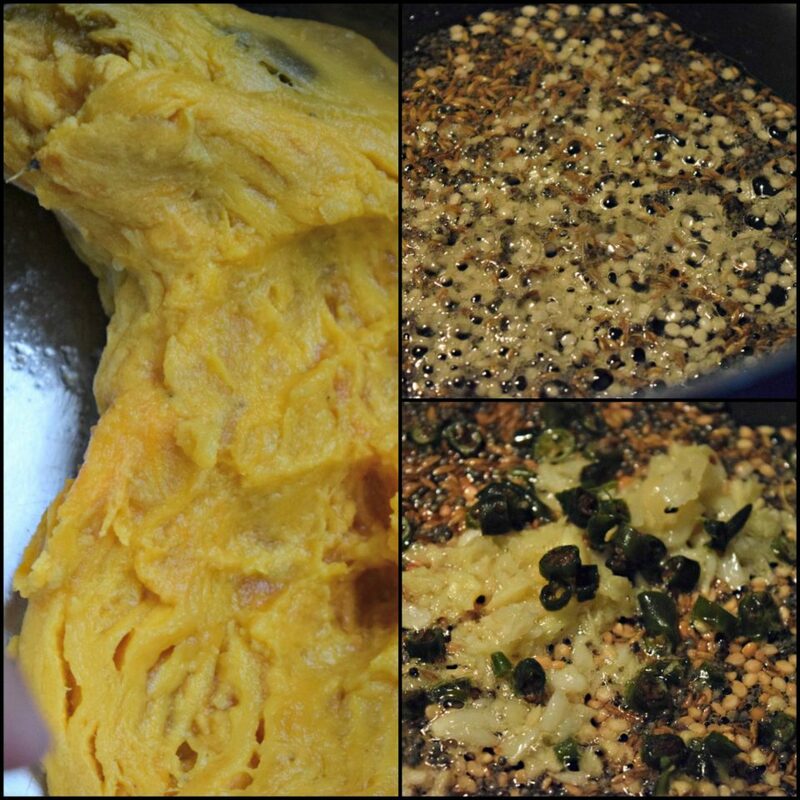 An authentic vegetarian Indian dish made with a surprise ingredient – Sweet Potato! Your dosa look incredible! They remind me of a french crepe (in appearance). Those fillings sound extraordinary! I have never had a masala with sweet potato filling! But it looks fantastic, I’m going to have to make it soon. How is your paining project going? Your photos are gorgeous! I love dosa too, but have never made them at home. This recipe sounds easy and delicious. I love sweet potato. Can’t wait to try! I love dosa! This looks so delicious!